There’s something rather awkward about Donald Trump’s latest tweet. WE all know Donald Trump loves a good Twitter rant against the "fake news" media. But this one may have backfired. 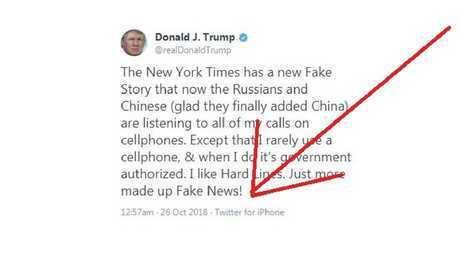 Last night, the President of the United States fired off a tweet in response to a New York Times story about his reckless mobile phone use, which has reportedly allowed officials in China and Russia to listen to his phone calls. He said the story was "sooo wrong", noting he only has a single government-issued phone that is "seldom used". But the tweet itself was sent from the Twitter app for the iPhone. Donald Trump tweeting — from an iPhone — about how little he uses his phone. It doesn't necessarily mean the President sent the tweet himself, as his aides have access to his Twitter account and occasionally do post on his behalf. Still, you've got to love the irony. 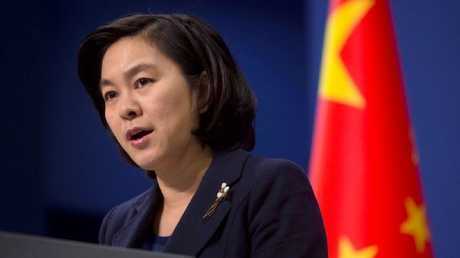 Foreign Ministry spokeswoman Hua Chunying denied China was listening in on the President’s phone calls. 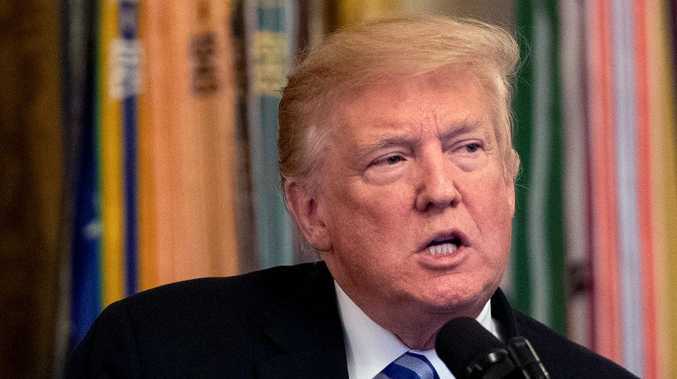 Taking a page from the US president's own playbook, China on Thursday denounced the Times report that it is listening to Donald Trump's phone calls as "fake news," and suggested he exchange his iPhone for a cellphone made by Chinese manufacturer Huawei. Foreign Ministry spokeswoman Hua Chunying did not provide any evidence or cite any specifics in her dismissal of the report in The New York Times. China tightly censors domestic media and routinely rejects critical foreign media reporting about the ruling Communist Party as biased or fabricated. Ms Hua told reporters that the journalists behind the report "are sparing no efforts to win the Academy Award for best screenplay". "Firstly, The New York Times should know that such report just provides another piece of evidence that the NYT is making fake news," Ms Hua said at a daily news briefing. In accusing the newspaper of fabricating news, Hua used language similar to Mr Trump's, who has often accused the "failing" New York Times of fabricating stories. "Secondly, I suggest they replace their iPhone with Huawei ones if they are really concerned about security issues," Ms Hua said. China said Donald Trump should switch his iPhone up for a Huawei model. 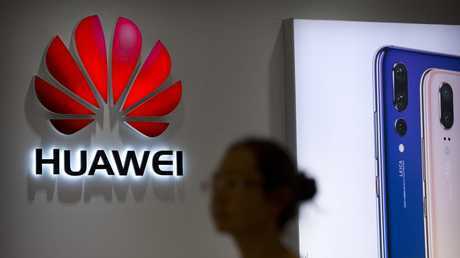 A 2012 report by a congressional panel said Huawei's equipment was a security risk. If the US is still concerned about security, Mr Trump could "abandon all modern communication devices and cut off contact with the outside completely," Ms Hua said. The Times reported that American intelligence reports said Chinese and Russian spies are listening in when Mr Trump calls friends on one of his iPhones and is using the information to try to influence him and impact administration policy. China has long been accused of efforts to target U.S. government, military and commercial entities with cyberattacks. In 2015, a massive hack of the federal Office of Personnel Management, widely blamed on China's government, compromised personal information of more than 21 million current, former and prospective federal employees, including those in the Pentagon.